This dessert by Chef Craig Flinn will make your guests go “wow”! Visually stunning and delicious, a second piece is a must. Using the whisk attachment of your stand mixer, beat the egg whites until soft peaks form. Slowly add the sugar one tablespoon at a time until the egg whites turn smooth and glossy. Fold in the lemon juice (or vinegar), cornstarch, and extract into the whites. 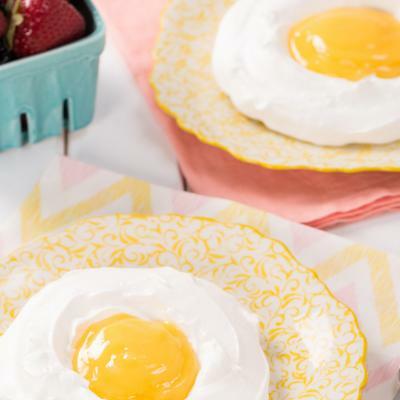 Trace a 10-inch dinner plate onto a piece of parchment paper and flip the paper onto a baking tray (so the pencil doesn’t make a mark on the meringue). 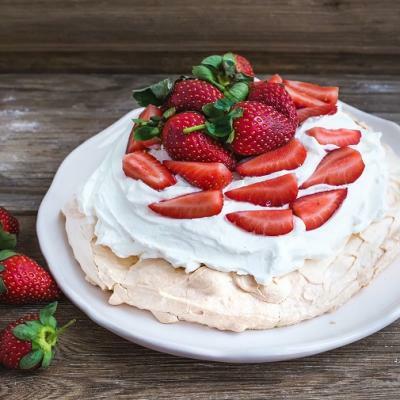 Spread the meringue, filling the round shape making the edges slightly higher than the middle, so as to allow room for the filling. 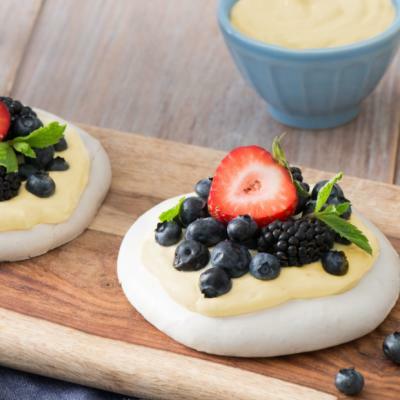 Bake for 1 hour until dry and crisp on the outside and firm to the touch, then turn off the oven and allow the meringue to cool completely in the oven. Set aside for assembly later. Place a glass or metal bowl over a pot of simmering water ensuring the water does not touch the bottom of the bowl. Place the egg yolks, 2 tbsp (30 mL) of the sugar, vanilla, and salt in the bowl and whisk until smooth. Cook gently until the mixture doubles in volume and looks pale in color, whisking continuously. Remove from the heat and add the chocolate, stirring until completely melted. In another bowl, beat the egg whites until soft peaks form, then add in the remaining tablespoon of sugar. Mix until smooth. In a separate bowl, whisk the cream until it forms stiff peaks. Fold the whipped egg whites into the melted chocolate in two smaller batches until just combined. Then fold in the whipped cream until just combined. Cover and refrigerate the mousse until ready to assemble. Toast the hazelnuts in a sauté pan over medium heat, shaking frequently, until golden brown (about 5 to 7 minutes). Remove from the pan and coarsely chop; set aside. Place sugar and water in a steep sided saucepan and stir well. Place on a hot burner and bring the sugar to a boil, but do not stir any longer. Cook until the sugar syrup turns amber in color and then remove from the burner. Carefully stir in the butter as it will foam and steam up in the hot syrup. Whisk continuously until smooth. Add cream, vanilla, and salt. Whisk until smooth and refrigerate until ready for use. 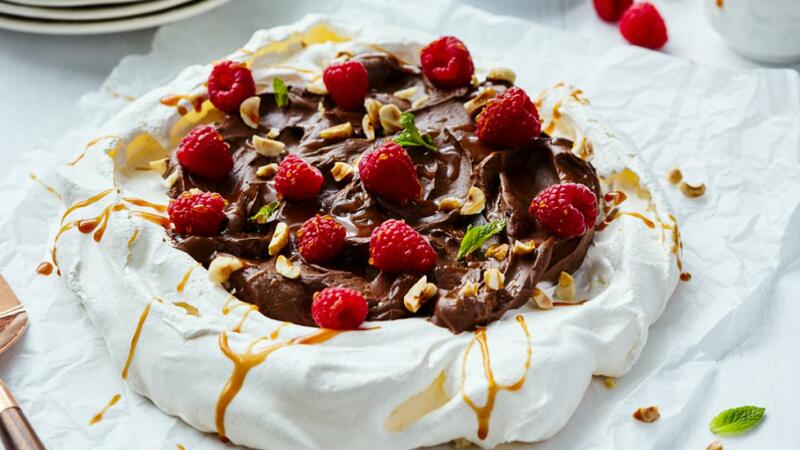 Place the pavlova meringue in the center of the plate and fill the middle with the chilled chocolate mousse. Sprinkle the mousse with chopped hazelnuts, raspberries, and chocolate shavings. Drizzle the top with salted caramel sauce and sprinkle fresh mint leaves.